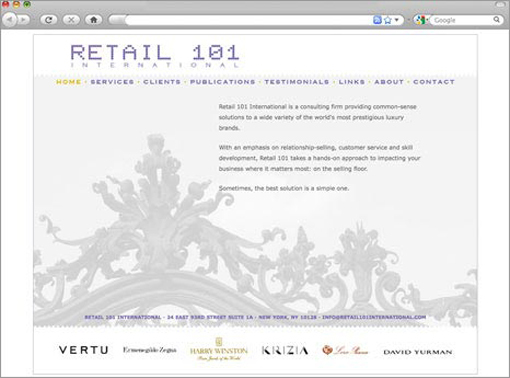 Cheryl Beale, principal of Retail 101 International, a global retail consulting firm, had a long list of prestigious luxury clients and needed a site to showcase her expertise. She had had an expensive and unpleasant first try to get a site launched and was appropriately apprehensive in approaching Studio K&M. We worked very closely with her, walking her through the process and reassuring her throughout each phase. We built a sophisticated site that appeals to her luxury clients and that is generating new business.